With its rich, deep and glorious blue the Sapphire enchanted us and we aimed to create a ring it deserved. 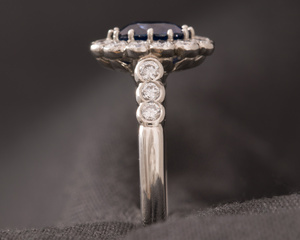 Neither dainty nor shy this engagement ring has a strong and yet very classic presence with intricate details, revealed only upon closer looking. 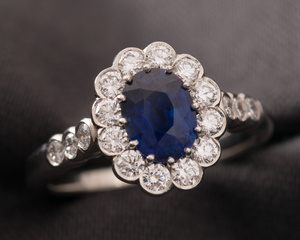 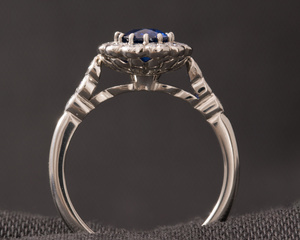 A scalloped, almost floral design is what gives the ring its vintage and at the same time unusual touch while further accentuating the beautiful Sapphire. 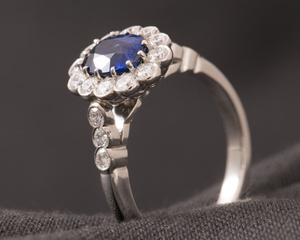 It is a piece full of sparkle and bold sophistication, a ring to be enjoyed and admired by others.